Gear: Juno106, JX10, JX8P, JX3P, MKS50, SY22, SH201, Micromoog, CP 251, Korg Legacy, Triton Rack, Ableton 9, APC40, Max/MSP, Focusrite Pro40, Jazz Bass. wanted to share a helpful jx8p editor for max for live that i found. especially useful with the recent max 4 live inclusion in the live suite package. just make sure sysex recieve is on on your jx8p! I use the iPG-800 and am pretty happy with it. C-level — I love the idea of controlling my JX-8p from Ableton live, but am new to Max and can't get this working right. 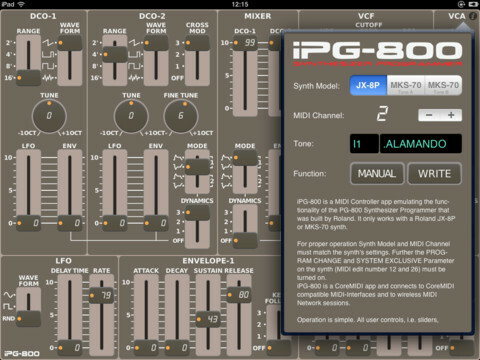 I'm familiar with setting up the synth to receive midi — I used to use the iPG-800 with my iPad, worked great, but either my 10-year-old iPad is now obsolete, or something is wrong with my synth, because I can't get them to work together anymore. Use a MIDI Monitor program to check MIDI data in and out of the JX. Make sure you haven't accidentally set your JX to ignore MIDI.